Tower of Guns was released in 2015, free for PlayStation Plus members at launch. While it didn’t make huge waves, the game was a fun homage to older first-person shooters that just needed some fine tuning. Terrible Posture Games and Grip Digital have been furiously at work on MOTHERGUNSHIP, which is at the very least a spiritual successor to Tower of Guns. We went hands-on with the upcoming game while at Sony’s PlayStation Experience 2017 expo, and have our impressions ready for you now. MOTHERGUNSHIP is a game that doesn’t appear to take itself too seriously. You are commanded by a sarcastic, anthropomorphic frog, who always seems eager to throw out a bad joke or two when the mood doesn’t strike. It’s obvious the comedy may fall flat with some gamers, but when the surrounding game is so easy to dip into, a few lame jokes are easy to forgive. Once again, the Unreal Engine powers the frantic action. Since the game randomly generates which room the player faces next, even the developer didn’t know what to expect. What they could tell us is that the game’s room picking logic avoids putting the player in the same type of room over and over. So don’t expect to always be in bullet hell – in some cases, there may even be a break in the frantic action for a spot of platforming over lava or something. The massive, slow-moving bullets from Tower of Guns were here in massive numbers, and the frame rate remained steady during our demo. 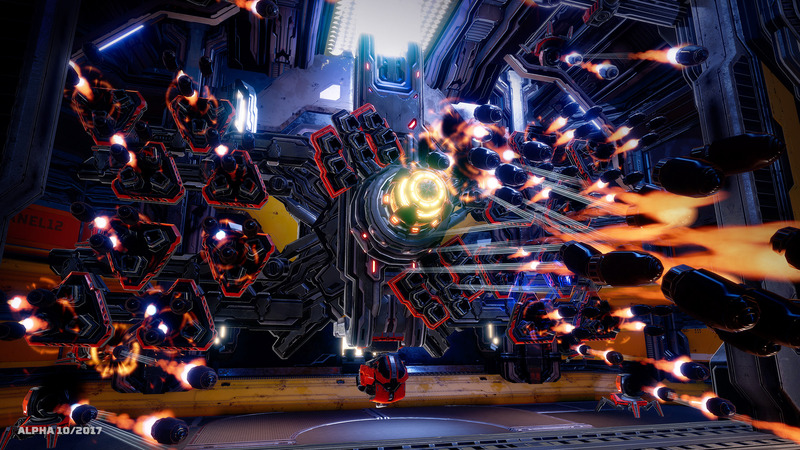 MOTHERGUNSHIP controls like most any first-person shooter. Something that takes a bit of getting used to is the fact that the player’s default move set includes a triple-jump. This means that even early platforming features areas that appear wildly out of place at first, but are in reality a jump, jump, jump away. In fact, during the boss battle near the end of the demo, there are glowing platforms which boost up the player when jumped over. These platforms replenish the player’s jumps, meaning even more time spent airborne if desired. Aspects such as this help to keep the action flowing, and some areas are so large they practically beg the player to attempt to fly. The biggest change from Tower of Guns involves MOTHERGUNSHIP’s new crafting options. As enemies are defeated, they occasionally leave behind loot. This can include powerups, such as adding to the number of jumps a player can perform before needing to land again, but this loot can also include gun parts and projectile launchers. These parts are connected by, well, connectors, which have various numbers of sockets. Some items are caps, which usually modify the gun’s stats, such as increasing firerate, or bullets per shot, and much more. As long as a barrel is pointed forward, the part will fire. It’s easy to see how players are likely going to spend a lot of time crafting some insane weapons. MOTHERGUNSHIP also features dual-wielding, so once a second gun is unlocked, it can be customized in exactly the same way as the first gun. During my demo, I was able to craft a doubled-up shotgun in my left hand, and a rocket AND buzzsaw launcher in my right hand. The trade off for larger guns is usually that they fire more slowly, since each component costs a certain amount of energy to have equipped. There isn’t a hard limit to how complex a gun can be, but the wait time between shots may become too long for some to handle. Then again, that’s what the second gun is for! It’s fun and even easy to craft weapons, so this will be a highlight of the game. MOTHERGUNSHIP feels like a game that will resonate well with any first-person shooter fan. While the shooting mechanics may remind many people of Quake or even Unreal Tournament, the crafting options are a very modern element, one that rewards experimentation. The improvements made this time around feel like a natural progression of the ideas first shown in Tower of Guns. With any luck, we’ll be blasting thousands of enemy robots (and even those poor, defenseless Hugbots) with ridiculous monstrosities as weapons, when the game launches in 2018.